Here at Hepworth Timber Work we firmly believe in the idea that the garden should be an extension of your living space. When the weather is good there is nothing better than enjoying the company of your family and friends outside in a private tranquil relaxing area. With today’s busy lifestyles it is essential for everyone to have a getaway from their busy lives, and with Hepworth Timber Work’s assistance we can help you to achieve this. From a simple fence to give you privacy, to a deck area to sit and chat, to a complete bespoke garden room Hepworth Timber Work are with you every step of the way from your initial idea through planning and onto installation. … and any other timber structure you might find in the garden! 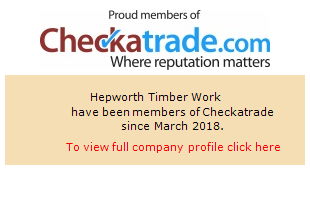 Hepworth Timber Work is a family run business with an emphasis on detail, work excellence and customer service. With a wealth of experience and knowledge we pride ourselves on our professionalism and ability to fully satisfy our customers requirements. Please feel free to contact us for any further information, or to make an appointment. We are fully insured for all works.